Home » NICET Certification – Fire Alarm System Pop Quiz Question: Remote annunciators shall be ____________? Remote annunciators shall be ______________? (a) painted red and mounted at least 42 inches above grade. (b) painted red and locked. 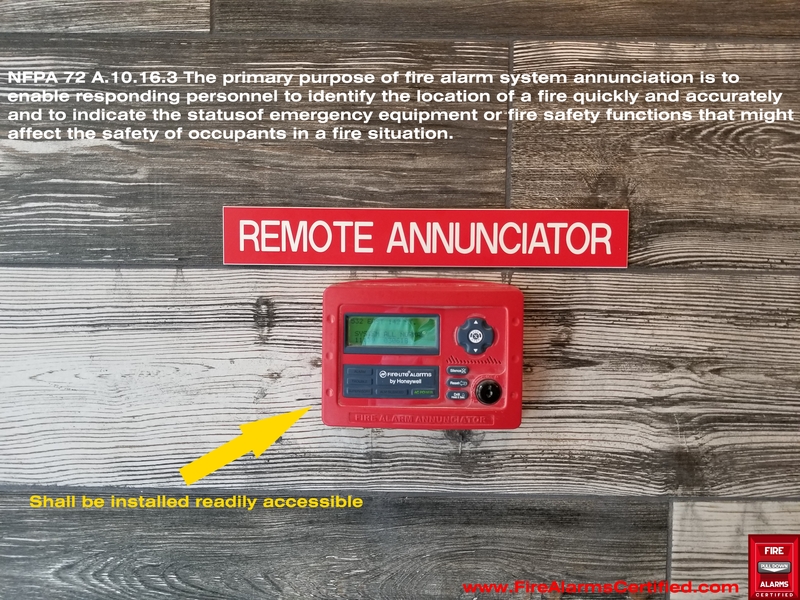 (d) be installed accessible to building personnel..
To find the answer to this question we use the index to locate the keyword, remote annunciator, which points us to 21.4.4. There isn’t much there to help us find the answer. So we next consult the keyword annunciation, which leads us to 10.16 for the answer: (c). While working on a low rise residential unit, I saw a nicely installed remote annunciator and decided to snap a picture of it. Pictured below, the remote annunciator is installed in the lobby of the entrance to the building and installed where responding personnel can simply walk up the the display and obtain which devices are in alarm so that they (Fire Department) can make a determination as to how to respond to the conditions. NFPA 72 10.16.3.1 All required annunciation means shall be readily accessible to responding personnel. NFPA 72 10.16.3.2 All required annunciation means shall be located as required by the authority having jurisdiction to facilitate anefficient response to the fire situation.